U.N. 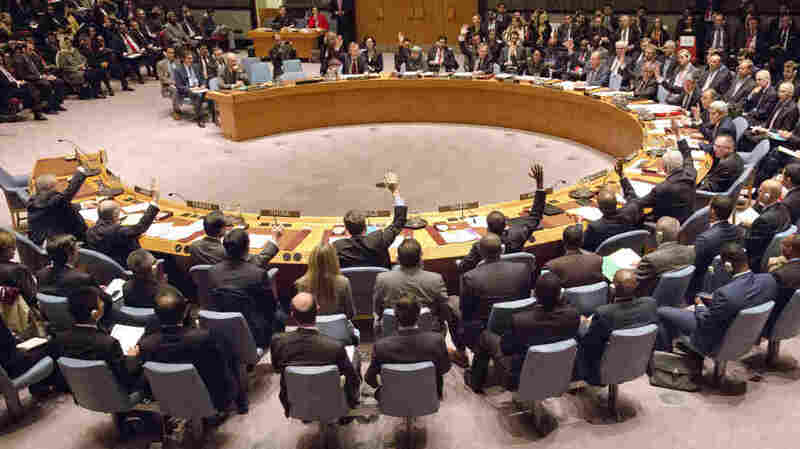 Passes Resolution Urging Political Settlement In Syria : The Two-Way The resolution does not explicitly address the contentious issue of Syrian President Bashar Assad's future in the government. It aims for an end to fighting and a focus on defeating ISIS. The U.N. Security Council voted unanimously Friday for a resolution supporting negotiations to end the fighting and bring political stability to Syria. Adopted 15-0, "the plan calls for talks on a political solution and a cease-fire in Syria, except in those parts under the control of ISIS," reports NPR's Michele Kelemen. Secretary of State John Kerry has been trying to muster diplomatic support to end the civil war in Syria and get all parties focused on defeating ISIS. The passage of the resolution Friday, he said, is a step in the right direction. "This Council is sending a clear message to all concerned that the time is now to stop the killing in Syria and lay the groundwork for a government that the long-suffering people of that battered land can support," said Kerry. That plan, however, makes no mention of Syrian President Bashar Assad's future in the government. "Obama says the Syrian leader has too much blood on his hands and has to leave for the war to end," Michele reports. But Russia has long supported Assad's regime and is unlikely to ratchet up the pressure on him. In fact, Michele adds, Russia's foreign minister is trying to shape the negotiations by calling for a list of which rebel groups in Syria are terrorists and which can participate in negotiations with the Assad regime.